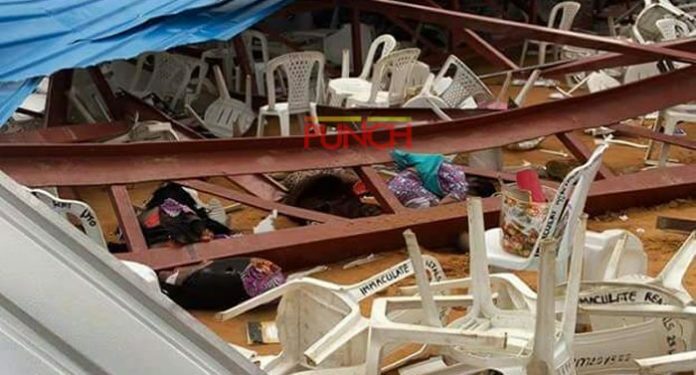 I have read the press release of Sunday December 11, 2016 on the Reigners Bible Church building collapse by the Chairman of the Nigerian Medical Association (NMA), Akwa Ibom State Branch, Dr. Aniekeme Uwah tilted: “SUN SET AT NOON“. I find the said press release incredibly misleading and duplicitous. He said that only 21 persons “were brought in dead” to the University of Uyo Teaching Hospital (UUTH) while 2 others died in the hospital. This is the only official figure of casualties of the incident given to the public by the NMA. The Akwa Ibom State Government on its part is keeping mute on the number of casualties and victims. The first question is: Is Dr. Uwah the Chairman of the NMA in UUTH alone or for the whole of Akwa Ibom State and are there no NMA members in other hospitals and medical facilities in the State where corpses and the injured were taken to other than the UUTH? One wonders why the leader of a responsible professional organization like the NMA will be playing politics with human lives. Whose interest is the Dr. Uwah-led NMA protecting with such inchoate and utterly obfuscating press release and figures? Does it mean that as the NMA Chairman, he has not yet visited other medical facilities in the State since the tragic incident to ascertain the total number of casualties? Is it only corpses that were taken to the UUTH that have been certified dead since the incident occurred and when should the public expect the complete figures from the NMA and the Akwa Ibom State Government? How can we prosper as a nation when those saddled with sensitive leadership responsibilities are annoyingly evasive and dishonestly reticent with facts, even of figures of the dead? Please note that Dr. Uwah did not state that his statement on the number of casualties and victims was preliminary. On the contrary, the press release was couched in a conclusive language and did not even acknowledge that several corpses and injured persons were taken to other medical facilities in the State like St. Luke’s Hospital in Anua, Uyo among others. He irritatingly circumscribed his statement on the number of victims to the UUTH as if that is where his jurisdiction begins and ends. It is a sad commentary that Dr. Uwah and the Akwa Ibom State Government have exuded contempt towards the public, the families and relatives of those who lost their lives. They have chosen to engage in shameful cover-up in order to undermine the gravity of the avoidable disaster that occured at Reigners Bible Church. And I ask again: Whose interest is Dr. Uwah and the Akwa Ibom State Government protecting? Could it be that of the owner of the ill- fated Church building, Apostle Akan Weeks? I became very displeased with Dr. Uwah’s press release after watching CNN this morning where his misleading figure was ostensibly relied upon by the international news channel in their reports on the incident. CNN initially reported that about 23 persons have been confimed dead (but is now reporting that about 50 persons were killed) but the reality is that the actual number of casualties far exceeds that number. Some reports have stated that more than 200 persons died in the incident. Reuters quoted eye witnesses to the effect that more than 100 bodies were recovered. Sahara Reporters on its part reported that more than 100 persons were killed. Other leading media have given different figures but none is less than 50. The public deserves to know the truth, the whole truth and nothing but the truth about the total number of casualties from the NMA and the Akwa Ibom State Government. The victims should not be mocked. The public should not be deceived. In saner climes, when disasters like this happen, the government momentarily and regularly makes details available to the press and the public. Here, our leaders foolishly hide and obstruct access to such information. We cannot continue to act insanely in this country and expect better results. I hereby publicly demand that the NMA and the Akwa Ibom State Government should immediately and truthfully publish in details, the total number of persons who died as a result of the disaster, including their names, gender, etc. Please note that this statement does not covey my position on the disaster. I shall certainly respond appropriately later.